O Great Spirit of the North, who gives wings to the waters of the air and rolls the thick snowstorm before Thee, Who covers the Earth with a sparkling crystal carpet above whose deep tranquility every sound is beautiful. Temper us with strength to withstand the biting blizzards, yet make us thankful for the beauty which follows and lies deep over the warm Earth in its wake. O Great Spirit of the heavens, in the day's infinite blue and amid the countless stars of the night season, remind us that you are vast, that you are beautiful and majestic beyond all of our knowing or telling, but also that you are no further from us than the tilting upwards of our heads and the raising of our eyes. O Great Spirit of Mother Earth beneath our feet, Master of metals, Germinator of seeds and the Storer of the Earth's un-reckoned resources, help us to give thanks unceasingly for Your present bounty. O Great Spirit of our souls, burning in our heart's yearning and in our innermost aspirations, speak to us now and always so that we may be aware of the greatness and goodness of Your gift of life and be worthy of this priceless privilege of living. 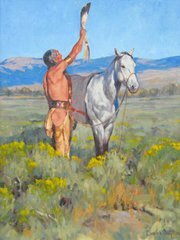 Note: Within minutes after posting the Wake up Call of Dec 30, 2010 I received this beautiful Native American picture and prayer in my email from a dear friend Gabrielle, in Chili, who received it from another dear friend, Ashok, in India. Thank you dear friends for showing us this treasure. Also thank you Noel Knockwood for creating the Prayer. Also, Bob is painting two pictures of Native Americans releasing birds to the Skies. He immediately saw how he could do a third painting in the same idea and combine them all with the Prayer, displaying them in a prominent place in our home. I saw the value of it all and the timeliness that it represented to the message from AA Michael. If this isn't Oneness in Spirit, I don't know what is.